Across my photography friends, there are many opinions on the best service to use to share their photos. Everyone has their own sites, but there are services to show photos and even selling all handled. 500px is a provider I use, it just works better for how I want to use the service over the other big name options. With the app Photo Stackr for 500px on my iPhone, I can do most of my photo management on the go. 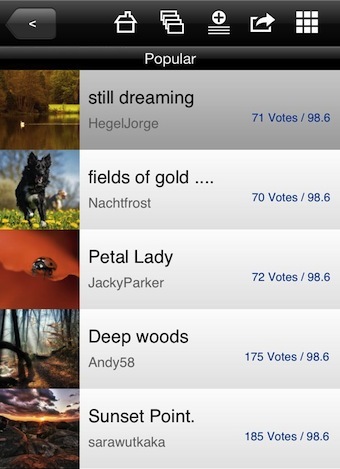 There is an app from 500px for the iPad that allows viewing of people’s photos and voting/staring. Photo Stackr goes a step further by working on my iPhone… and I can upload photos from the iPhone directly to the 500px service. The upload process is complete with metadata entry and the other particulars entered with a photo when using the Web browser version. The Photo Stackr for 500px is a universal app so your copy will work on both your iPhone and iPad. 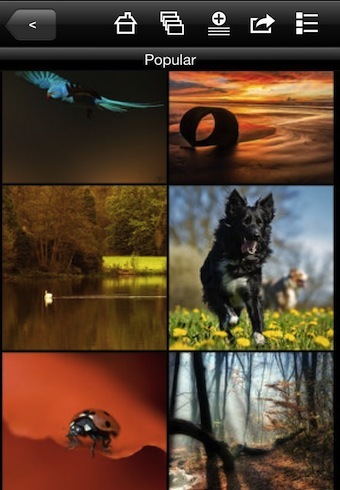 Viewing photo thumbnails is like the Web site view, with the ability to narrow the photos viewed by their groups (Abstract, Animals, Black and White, Celebrities, City and Architecture, Commercial… and so on). Photo Stackr for 500px has a nice feature of two finger pinch/expand to view larger thumbnails in any of the category overview screens. 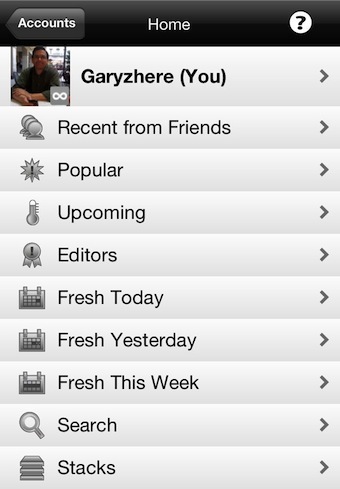 List view is also supported, giving you quicker access to see some basic information about a photo. Along with categories of photos, and tags, Photo Stackr gives access to the grouping available through the Web interface: Upcoming, Popular, Fresh, Friends and your Profile. 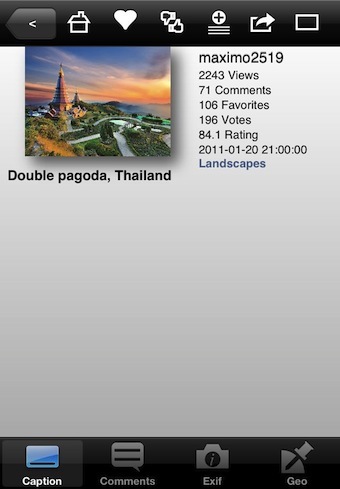 This ‘Home’ area is where you access ‘uploading’ to send photos right from your iPhone to 500px. There is also settings for how the photos are shown in slideshow mode and if you want to save photos to your iPhone for offline viewing. 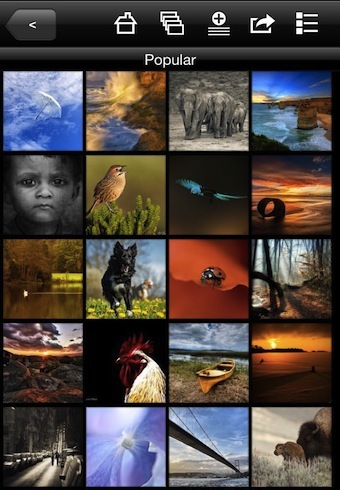 Choosing an image give you a full screen view. Each photo can be liked and voted, as well shared and commented on. More info on images is also available through Photo Stackr, giving you a view of the photo’s specification and assigned tags and metadata.